Hello Aspirants, looking for Best SSB Coaching Centers in India. In this article we have covered all the best SSB coaching centres information. Checkout the complete article and read the info. Feel free to ask questions in below comments. Services Selection Board (SSB), is the Personality and Intelligence Interview spread over 5 days which scientifically analyses each candidate's potential and compatibility for commission into the Armed Forces of India. The main objective of this interview is to test the mental and mindset capability of every candidate who is planning to join the military. The interview exercise is mainly a Psychological tests of the personality quiz of the candidate, to gauge his/her potential as a future Officer in Indian Military. The tests conducted by the SSB aim at selecting individuals with OLQs (Officer Like Qualities). The selection system is designed over a five-day process, Day 1 is the screening test, Day 2 is the Psychologist Tests, Day 3 & 4 is the group tasks and Day 5 is the Conference(Results). The personal interview will be conducted either in day 2,3 or 4 during the post lunch or evening hours. Candidates who have cleared written examination to qualify for SSB would be having questions about to join best SSB coaching centers in India.So we have listed top 10 best coaching centers in India so kindly go through the article and check the SSB coaching training in India.Any questions or doubts feel free to ask below in comments. This is among the oldest and promising SSB coaching centers in the country. Located in Bangalore and Chandigarh these institutions provide excellent SSB coaching to prepare candidates for the SSB interview and examinations. They also provide many other coaching services essential to the country’s defense force. What makes these sister SSB coaching centers stand out is the fact that they are specialized and result oriented, meaning if you attend any one of them, you are sure to pass your SSB exam and interview with flying colors. This popular SSB coaching center has mastered new concepts owing to the fact that it has spent many years helping defense forces with training. Due to this, the academy has been able to acquire practical experience in SSB coaching which can help new candidates to not only pass their SSB examinations and interview but also acquire great leadership, judgment as well as logical reasoning skills. Baalnoi SSB coaching center has many psychologists and instructors who use the inner self approach to identify personal traits of every candidate and then work on enhancing these traits to make them prominent and noticeable at the selection center. This is also among the top 10 SSB coaching centres in India where aspiring SSB candidates can undergo intense coaching about how to excel in the SSB interview and examination before they can join the military. The institute is located in Chandigarh and run by prominent military personnel who have many years of practical experience working as SSB interviewers. These coaches know every aspect of SSB coaching thereby guaranteeing students a better chance of passing the SSB exam and interview. Located in Meerut, this well known institute has been offering SSB coaching for over a decade now. It covers all aspects of the SSB training including preparing candidates for SSB examinations as well as interview. Candidates are coached under the guidance of a senior military personnel who is the Group Testing officer. Diligent instructors are also available to guide candidates how to pass the written SSB exams and any other SSB test. This is another great institute located in Coimbatore which you can attend to prepare for the SSB examinations and interview. It has been offering SSB coaching since 2005 with a long track record of being among the best SSB coaching centers in India. The SSB coaching program takes 10 days and candidates are provided with self study kits as well. Unlike most SSB coaching centers, Defense Academy usually enrolls a very smaller number of candidates to enable instructors to provide personalized attention to every candidate around the clock. This institute is also among the top 10 SSB coaching centres in India providing incomparable SSB interview and exam coaching. The school is consistent in delivering results and up to date, over 100 candidates have made it through. This successful SSB coaching center is committed in providing overall personality training to its candidates which not only enables them to pass the SSB interview and exams but also to excel in other fields. While it is still up-and-coming, this SSB coaching center is already present in the list of top 10 SSB coaching centres on India. The institute provides training for SSB and AFSB interview as well as exams, personal attention on developing creativity and stress management as well as many other coaching programs relevant to those who are aspiring to join the military. Located in Gurgaon, this institute aims to enhance the mental and mindset capability of every candidate who is planning to join the military. It uses experiential coaching approach conducted through various adventure and outbound/inbound activities to prepare candidates for SSB exam and interview. Learners are exposed to look alike SSB exam and interview experience, giving them more confidence in their own capabilities to pass with flying colors. Based in Pune, Khandekars Eagles Academy is also one of the best SSB coaching or training centers in India. Coaching is provided by Ex Senior Group Testing officer. The center conducts basic preparation for SSB interviews and CDS/NDA exams to holistically prepare the candidates for the Service Selection Board interview and examination. This name can never be left out whenever people are talking about the top 10 SSB coaching centres in India. Located in Pune, this well known SSB coaching center has recorded a high percentage of admission rate of candidates into the country’s defense schools most coaching centers have never. Instructors provide both indoor and outdoor training for overall preparation of the candidates waiting to take the SSB exams and have the interview. 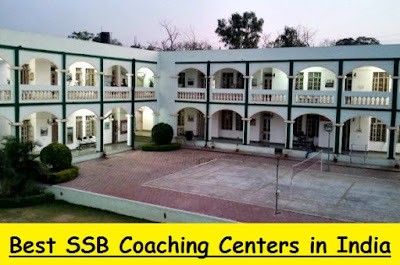 Hope you liked our article on Top 10 best SSB Coaching Centers in India. Our country's Indian armed forces needs brave, skilled and dedicated officers to protect our country. The above mentioned SSB coaching centers would help you to inculcate those needed qualities and would help you to make you eligible for SSB and would make you aware of OLQ's needed for clearing SSB. This various SSB centers would help you to develop your skills and mind set towards your goals and providing grooming to come up with commissioned officers for Indian armed forces. For any critics or Questions in mind regarding Top 10 best SSB Coaching Centers in India feel free to ask below in comments. Wish you all the very best for SSB & bright future!